On July 4, 1817, at Rome, New York on a site now occupied by the Worthington Industries Steel plant, there was a ceremony allegedly turning the first spade of earth on the construction of the Erie Canal, one of the most important public works projects in history. As we approach the Bicentennial of the Canal’s construction, we would do well to better understand this history and its importance. On July 2, 2017 there will be a march through Lower Manhattan sponsored by the Lower Manhattan Historical Association celebrating this event. The idea that it might be possible to create a passageway across New York State from the Hudson River to the Great Lakes predates the American Revolution. 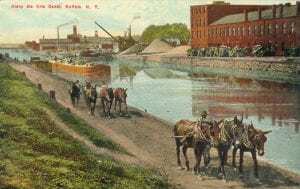 In 1724 Cadwallader Colden (whose grandson would later be Mayor of New York City when the Erie Canal was under construction) recognized the possibility of such a canal. It was shortly after the American Revolution, in the 1790’s that Phillip Schuyler and a group of New York businessmen incorporated the Western Inland Lock and Navigation Company to build a water portage across Wood Creek at the mouth of the Mohawk River to facilitate the transportation of goods from the Hudson River to Western New York State. 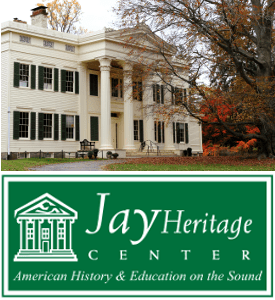 Although encouraged by the State of New York, this private effort failed for lack of capital, as the company went bankrupt in 1798. The problem of developing Western New York State, and transporting goods from the Hudson river remained a vexing one for many upstate merchants. In 1807, an upstate flour merchant in Batavia, named Jesse Hawley, experienced these problems first hand. Unable economically to transport his products to the Hudson, he went bankrupt and wound up for an extended 20-month stay in debtor’s prison. While in prison Hawley, writing under the name Hercules, wrote a series of fourteen essays later published in the Genessee Messenger in which he laid out a plan for a manmade waterway across New York State that would effectively transport goods from the Hudson River at Albany to the Great Lakes. Hawley argued that such a waterway would effectively invigorate commerce in Western New York State as well as along the Hudson down to New York City, and provide New York State with a premier position as the major gateway to the Midwest. This prescient series of essays in essence represent the first significant writing concretely to call for the construction of the Erie Canal in the form and along the route it actually took. Meanwhile, other prominent men either had, or were developing, interest in Hawley’s ideas for a grand canal across New York State. Gouverneur Morris, a prominent landowner, lawyer, politician, and later diplomat who played a significant role in the formation of the U.S. Constitution, became an enthusiastic supporter of the idea, as did steamboat entrepreneur Robert Fulton. With federal support out of the question, New York backers of the Erie Canal were soon stymied by the War of 1812, much of which took place on the state’s northern and western borders. After the War of 1812 canal backers tried a new strategy — seeking direct support from the state’s voters through a public relations campaign. At the time democratic government was a relatively new phenomenon and the idea of seeking direct support from the general public to influence public policy was somewhat novel. Backers of the Canal organized a meeting in New York City to gain support for it. 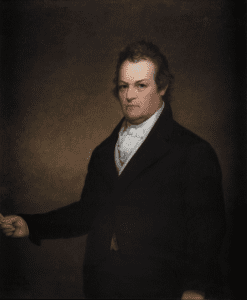 They enlisted the active participation of prominent Canal Commissioner and former New York City Mayor DeWitt Clinton. While Clinton was undoubtedly a politically controversial figure disliked by Democratic party partisans that backed President Madison, his enthusiasm for the project, his previously important governmental positions and his eloquence and vision would prove to be critical to the effort. On December 3, 1815, an overflow crowd assembled at the City Hotel at 115 Broadway to draft a memorial to the New York legislature and drum up support for the project throughout the state. The Memorial was a huge success and further meetings in support of the Canal were throughout the State. Petitions bearing thousands of signatures in support were delivered to the State Legislature, but there remained significant opposition, particularly among DeWitt Clinton’s political opponents, many of whom were from New York City. The opponents generally argued that the project was much too risky. The longest canal previously built in modern times was the Languedoc Canal constructed in the late 1600s connecting the Mediterranean and the Bay of Biscay, approximately 140 miles. 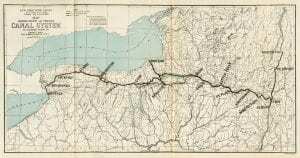 The proposed Erie Canal would be three times as long and go through much more difficult territory. It would also have to traverse an area with an elevation of 600 feet, which no canal had ever done. In 1816, Canal opponents in the New York State Senate (including democrat Martin Van Buren of the so-called Albany Regency) were able to have the project delayed for further study. However, in 1817, much to the chagrin of his political opponents, Clinton, whose political career had been considered finished in 1812, ran for Governor and was overwhelmingly elected. Nevertheless it was still unclear whether Canal proponents had the votes to obtain approval in the New York state Senate, when in a dramatic moment Martin Van Buren, Clinton’s arch political rival from Kinderhook in Columbia County rose to the Senate floor to announce that although he had previously opposed the Canal, he believed the time had now come for all New Yorkers to support it. Twenty years later Van Buren would become the President of the United States and he would often refer to this vote as the most important of his career. 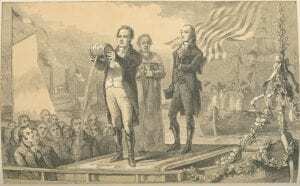 Although there was still one further hurdle in having the Canal approved by the Council of Appointment, Van Buren’s speech supporting the Canal meant that the political battle for its approval was over. The people of the State of New York on their own had now decided to undertake one of the most daring and risky entrepreneurial projects in history. By the beginning of July, 1817, the issue had shifted from obtaining approval for the Canal to the practical problems of its construction. The legislation approving its construction had stated that it was to begin at Rome New York and proceed approximately 70 miles to Syracuse. This was a fairly flat area over which construction would be easiest. The Canal’s promoters had hoped, the construction of the initial stretch went relatively smoothly and the initial part was completed on time and relatively close to budget. This was something of an achievement given that there was no precedent for a public works project of this type and there were no engineers in the United States with any experience in canal building. Benjamin Wright and James Geddes the two chief engineers on the project were surveyors and lawyers by training. The financing for the initial section of the Canal came largely from savings banks throughout the state, as no foreign or major commercial lenders were willing to take the risk. By 1819, traffic on the middle section of the Canal began to run ahead of projections and foreign lenders showed much greater interest. With the apparent success of the initial section, political opposition to the Canal abated. In a ceremony at Syracuse in 1820 formally opening the middle section, DeWitt Clinton boasted that by 1823 the waters of Lake Erie would flow to the Atlantic. In reality, the Canal builders had greater problems where the terrain was more difficult. Just as their critics predicted, the area around the Niagara escarpment near Niagara falls – where the Canal would have to go up a significant height – proved very difficult and the work fell behind schedule. An extensive system of mechanical locks at Lockport, unlike any thing ever previously constructed in the world broke through the Niagara escarpment. By October of 1825, the Canal was competed from Albany to Buffalo. The ceremonies celebrating the completion were enthusiastic and lavish,. On October 26, 1825 at Buffalo, Governor Clinton boarded the Erie Canal packet boat, the Seneca Chief, for an eight-day voyage across the entire Canal and down the Hudson to New York harbor, stopping for speeches and festivities along the way. On November 4, 1825, Clinton sailed out to the Atlantic Ocean in New York harbor and poured a keg of water from Lake Erie into the Atlantic in a ceremony known as the “wedding of the waters”. Celebrations in New York City and other cities across the state lasted for days, as New Yorkers congratulated themselves on having completed the project. The economic and political impact of the opening of the Erie Canal was immediate and beyond its most enthusiastic backers’ expectations. The cost of shipping a ton of wheat overland from the Ohio valley through New York harbor dropped from $100 a ton to $6 a ton. New York City now had a direct water route to the Midwest, which would give it a tremendous advantage on trade to and from Europe. Rather than trade going down the Mississippi river to New Orleans or north up the Saint Lawrence River to Canada, most American products from the Midwest would be shipped almost 500 miles across New York State to New York Harbor. The City of New York would quadruple in size over the next fifty years, far outstripping rival eastern seaboard port cities such as Philadelphia, Boston or Charleston South Carolina. Wall Street would soon eclipse Chestnut Street as the nation’s financial capital. Cities along the route of the Canal such as Utica, Rochester, Syracuse, and Buffalo, which were mere villages when construction on the Canal started, would blossom into significant commercial centers . Tolls on the Erie Canal paid off the costs of its construction in eight years, rather than the projected twenty. The Canal provided millions of dollars annually to the State by the mid-19th Century, making New York the most politically and economically important city in the nation. Equally as important as its economic impact, but not as widely recognized today is the Canal’s impact on world history in terms of promoting democracy. At the time the Canal was begun in 1817, the idea that a democratically elected government could successfully provide for its people and survive in the long run was far from clear. Most of the world was ruled by hereditary monarchies and the historical precedents for the survival of democratic governments were not great. Prior to the 19th century most political theorists believed democracies were inherently unstable and unable to meet the needs of their people. The opening of the Erie Canal essentially proved this was not true. With the opening of the Canal land value skyrocketed throughout New York State, and optimism about the future and the democratic form of government swept through the city of New York and and the nation. Promoters of the Canal were conscious of the fact that New York State – after a full and fair public debate of a type unheard of in a monarchy – was able to achieve a work of this nature to foster broad-based prosperity for its people. The example gave heart to supporters of democracy around the world. By the end of the 19th century, monarchies around the world were soon in retreat, and democracy would become the predominant form of government internationally. 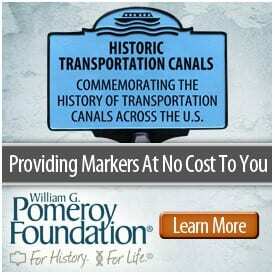 It is estimated that 1.6 billion people today live under some form of democratic government, so it would be unfortunate, as we approach the celebrations of the Bicentennial of the construction of the Erie Canal, if we fail to recognize these more intangible benefits and achievements of the Canal.